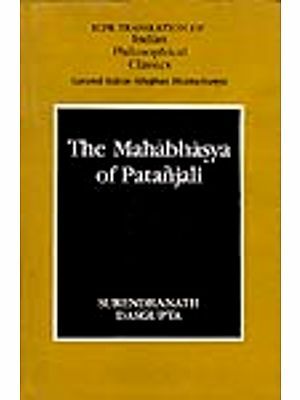 The Mahabhasya of Patanjali is an encyclopaedic and authoritative work on Sanskrit Grammar. On the strength of references to the Maurya kings, the wealth of the Nandas, the Siege of Ayodhya and the sacrifice performed by King Pusyamitra, it is believed to have been composed in the second century B. C. Barring the Pratisakhya works, if they are looked up on as works on Vedic grammar, panini's Astadhyayi is looked upon as the oldest existing work on Sanskrit Grammar. 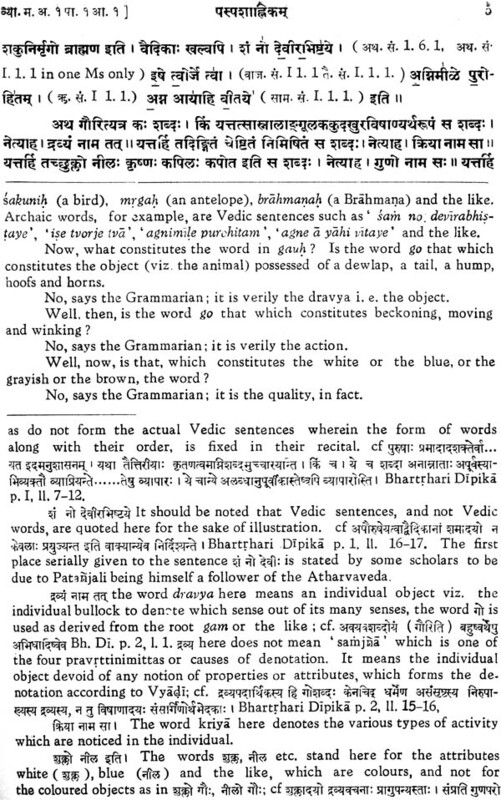 The Varitkas of Katyayana and others which number more than five thousand, are short pieces of comment upon the several topics of grammar which are found in the Astadhyayi, and the Mahabhasya of Patanjali is a scholarly brilliant gloss upon the Vartikas which the author was able to collect from different centres of the study of Panini's Vyakarna in the vast country from Gandhara in the North – west to Vanga and Suhma in the south-east. There are stories about the break of continuity in the traditional instructions of the Mahabhasya and the consequent revisions of the text. A careful scrutiny of the text, however shows that there is not much truth in those stories as the present text shows a uniform style and method of presentation from the beginning to the end of the text. The differences in readings also, do not show any long interpolations. A few references in the text show that there were a few glosses on the Astadhyayi before patanjali. References by the word Bhasya' in passages like lead some scholars to believe that there was a short 'bhasya' written by gonardiya or some scholars to believe that there was a short contrast with the Present work which is named as Mahabhasya. 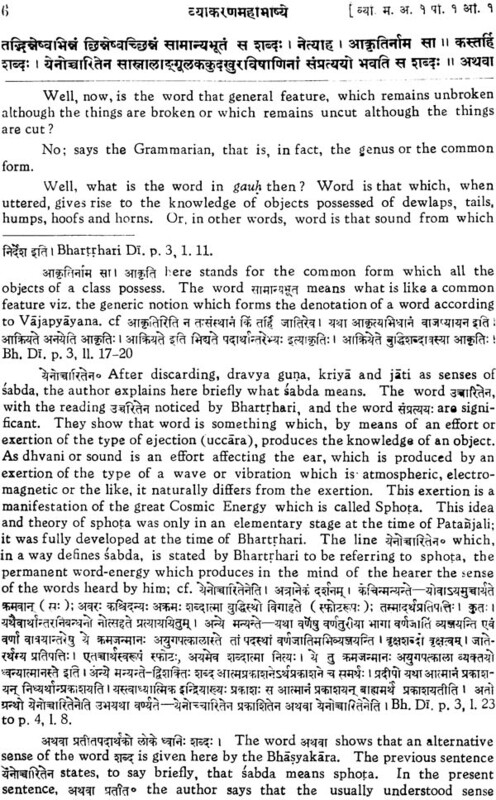 2 Although the Sutras of Panini apparently deal with the formation of words in the Sanskrit language, which were available in the Vedic Literature as also in the spoken Sanskrit language at the time, and although Panini has made a clear statement in the rule (I.I. 68) to that effect, it is remarkable that in the process of the formation of words, he has given a careful consideration to the sense – element everywhere. Not only that, but his rules in the karaka and lakarartha sections are more concerned with sense than with word. The author of the Vartikas has moved a step further in this respect. He has commenced his work with a categorical remark viz. That the connection between word and sense is permanent is an established matter. He has in fact laid down on a firm foundation the supreme necessity of the consideration of sense in the formation of words, which marks the main line of difference between the viewpoint of the etymologists and that of the grammarians. 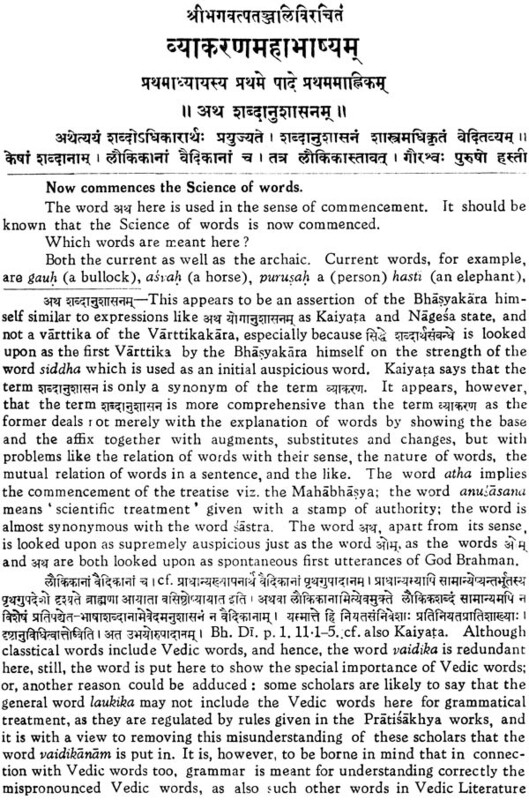 The author of the Mahabhasya commences his learned discourse on the Varitkas with the introductory statement' now commences the science of grammar' which clearly shows that patanjali has not only commented critically upon the five thousand and odd vartikas, but written his bhasya as a scientific treatise on Sanskrit grammar. 3. 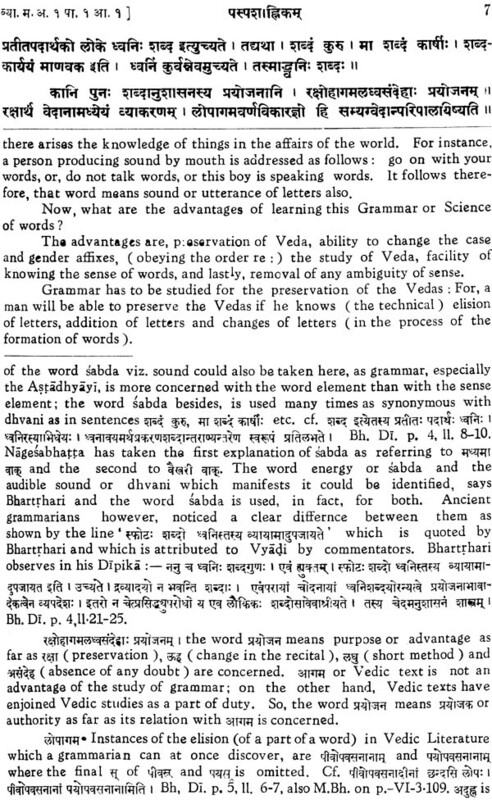 The Science of Sanskrit Grammar founded by patanjali, is noticed to have developed into three different branches (formation of words) (determination of sense) and (the connection between word and sense). Seeds for the development of these three branches were scattered everywhere in the different Sections of the Mahabhasya and learned scholars of posterity have composed separate texts in these branches. For example the Kasika, the Siddhantakaumusi and the Laghusabdendusekhara can be said to be the representative texts of the branch of the formation of words. The Paribhasasucana of Vyadi, the Brhatparibasavrtti of Siradeva and the Paribhasendusekhara of Nagesabhatta have shown the development of the branch of sense determination; while, the vakyapadiya of Bhartrhari, th Vaiyakaranabhusana of kondabhatta and the Laghumanjusa of Nagesabhatta bear a sound testimony to the development of the branch of relationship between words and their sense. 4. About the life and personality of Patanjali, very little information is available. The various anecdotes about his birth and the belief that he was an incarnation of Sesa, which are recorded in the Patanjalicarita and the Kathasaritsagara, can at the most show that he was an orthodox Brahmana living the extremely pure life of a sage, visiting like persons of the Yayavara Sect, the different centres of study in the vast country and giving discourses on Sanskrit Grammar. Although some scholars believe that he belonged to the Gonarda country, still, references to various towns and districts and the peculiarity of accents and word – formation therein noticed and recorded by him in his work, show his admirable familiarity with the different towns and the districts of the northwest provinces like Gandhara and Vahika as well as the south – east provinces such as Vanga and kalinga. Probably , he was born in Gonarda in the Central parts of the vast country, was educated in Gandhara and was imparting instructions to pupils at pataliputra. He was possessed of a keen and penetrating Intelligence, by means of which after discussing the different explanations and views about the interpretation of some crucial sutras, he has given his final judgment which has not been set aside or called into question by any of the later authors of works on grammar or by any learned commentators. 5. Patanjali has in his gloss subdivided the thirtytwo padas of Panini's Astabhyayi into eightfive sections which are named Ahnikas or day – lessons. He has commented upon only 1228 sutras of Panini out of the total number which is said to be 3972 according to the traditional recital. 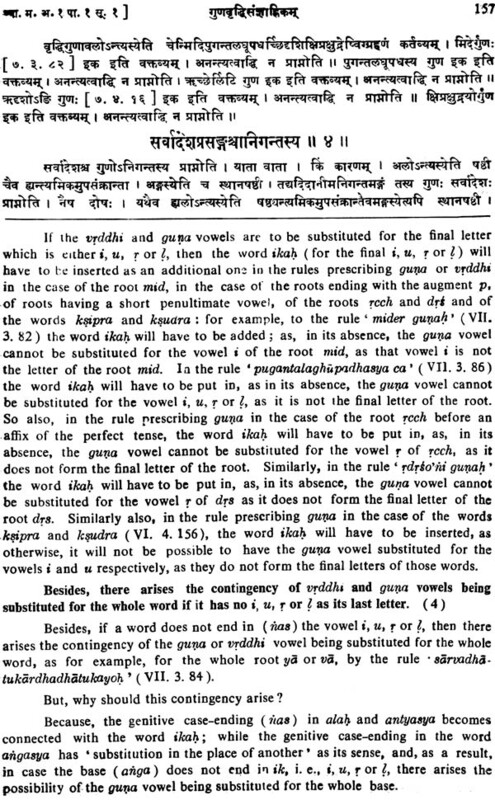 The number of Vartikas upon these 1228 sutras goes above 5000, to which Patanjali has made an addition of some statements which are similar in nature to the varttikas he has commented upon, and which are known by the term isti in the schools of traditional instructions. 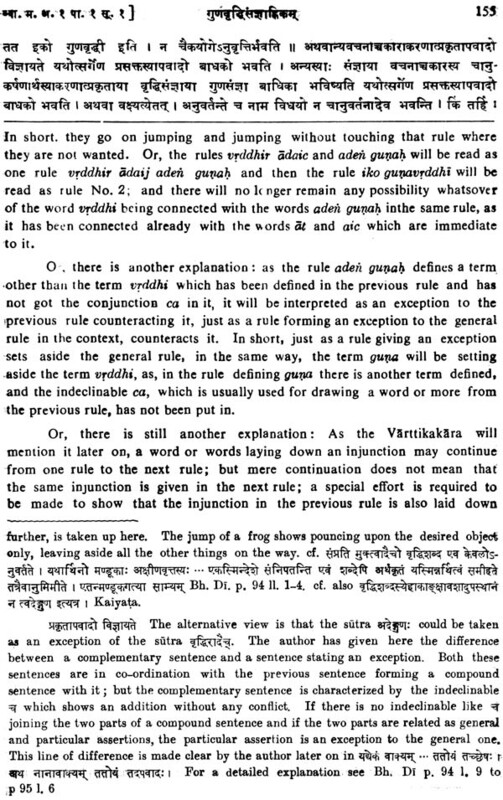 Some editors have made an addition of some statements of the Bhasyakara by considering them as varttikas. Scholars like Dr. Kielhorn have tried to find out some tests to differentiate the Varttikas from the statements of the Bhasyakara: but, so far none has succeeded in culling out definitely the old Varttikas on which patanjali has written his comment. Besides Varttkas, Patanjali has given about a hundred maxims of interpretation known as paribhasas and well- nigh more than three hundred illustrative maxims or Laukikanyayas. The number of small and big topics discussed by him goes well –Nigh beyond three hundred. Out of which a large number is found in the first nine lessons which are well-known by the term navahniki. His long scholarly explanations of some sutras like Popularly known as or known popularly as have been incorporated into separate Ahnikas . 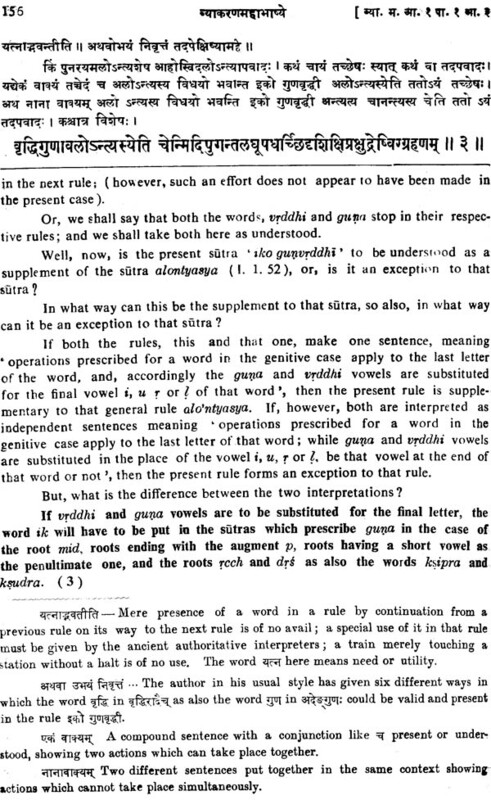 the pratipdikasamjnahnika (No XI), the Ekasahnika (No XII) the karakahnika (No, XVII), the Samarthahnika (XIX) and the lakararthahnika (No XXXIX) can be looked upon as brilliant articles discussing the nature of the relation of words with sense as well as the inter-relation of words based upon sense, and possessions thereby a considerable semantic importance. 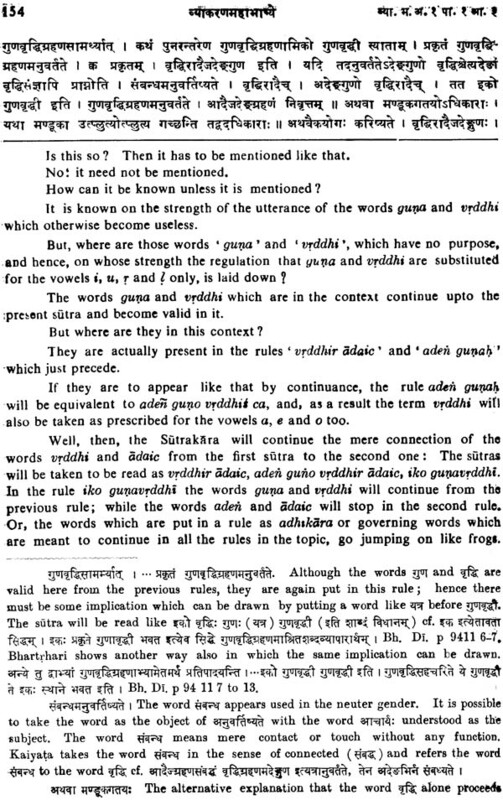 His discussions on the general topics such as vipratisedha (conflict of sutras), vibhasa (option) adhikara (jurisdiction) sthanivadbhava (originalization) and Karmavadbhava (treatment like an object) rouse a surprising interest: while the explanations of grammatical terms such as and the like form independent topics by themselves. 6. His work is flooded with brilliant quotations which are offered by him quite spontaneously and which fully attest his powerful memory. The number of quotations wellnigh exceeds seven hundred. Out of which more than half the number belong to the Samhita, the brahmana and the Aranyaka vadic literarure and the Srauta, grhya and bharma sutras. They are all produced by him from his memory. It is noteworthy that there are some among them which cannot be traced to their traced to their sources inspite of a number of indexes of vedic words compiled at present, which are readily available. There is a large number of quotations from the Epic and Classical literature of those days, many of which cannot be traced to their sources as many of the classical works of his time are not available to-day. The number of Varttikas in veerse, also exceeds a hundred. Many of these Slokavarttikas present small bits of sentences helpful to a student to remember easily a long continuous discussion on an important topic. With a conversational style, which is natural yet dignified, the work nas been so graceful, and the had problems of grammar have been so thoroughly discussed that no scholar after Patanhali dared making any additions or suggesting any modifications. The work is a marvellous specimen of perfection and beauty bearing a testimony to the author's quotation which, in short, means Perfection is Beauty and Beauty is Perfection.